New York, NY Louis Baugier, a JP Morgan and RXR Realty alum, launched Surecave, a NYC-based real estate technology company that allows landlords/property owners to better manage their business – everything from finding tenants to managing multiple properties and even allows renters to pay rent in cryptocurrencies. The company has raised $1 million from real estate companies that include First Midwest Group, TransUnion, Remax and Silverback Development. “Today’s renters demand a better rental experience,” said Baugier. ”Today there are one-click purchases on Amazon. We should have one-click rent, or at least a seamless way for managers and tenants to communicate with one another.”Surecave’s proprietary software enables property owners/managers to better communicate in real-time with tenants. The technology is designed to improve and build performance, tenant satisfaction and manager reliability and simplify essential property management tasks such as: sending and tracking payments, executing maintenance requests, digitizing the application process and accepting rent payments in cryptocurrencies. It also gives tenants the online ability to buy everything from insurance to kitchenware from Surecave affiliates. “Managers who don’t offer a renter-friendly solution will have higher vacancies and unhappy tenants—tenants who tire of the same painful rental experience,” said Baugier, who developed the app when he saw the property management industry was in dire need of technological innovation. “The nature of property management business is fragmented and cross vertical, there was a real need to create a better way to operate a management business,” added Baugier. Working at JPMorgan and RXR Baugier took what he learned about the industry. Armed with entrepreneurial fever he knocked on doors of forward-thinking real estate investors like Josh Schuster, managing principal at Silverback Development, to help raise enough funds to seed a beta product. 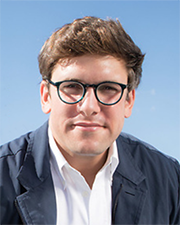 Baugier began his career in the Global Real Estate Portfolio Management group at JPMorgan Chase group where his first project was the Hudson Yards relocation initiative. While at JPMorgan Chase, he was responsible for underwriting and evaluating portfolio strategies across a number of different asset classes and geographies. At RXR Realty, Baugier gleaned valuable insight into the fragmented process of property, and subsequently, asset management. Baugier was the fourth hire on a development platform managing $3.3 billion of inflight projects. During his time at RXR, Baugier and his group oversaw the closing of over $1 billion in new developments. “Managing a property is difficult due to the number constituencies involved, but aligning them on a platform where everyone has something to gain has powerfully resounded with our clients,” said Baugier, who is confident Surecave can differentiate itself in the emerging real estate technology space. “The stove-piped legacy software players and the upstart tech companies have not accurately underwritten the value of a cross-vertical solution that touches all major constituencies involved in a properties lifecycle, including the LP or asset manager,” Baugier added. At Surecave, Baugier also assembled the top technology innovators – the company’s engineering team are all graduates of MIT and Duke. “We employ the most cutting-edge technologies and partnerships in the most novel, value accretive ways,” Baugier adds. Born on Long Island, Baugier grew up in Greenwich, Connecticut before graduating from Tulane University with a BS in finance and BA in French literature where he was an All-American rugby player. An avid marathon runner, Baugier has completed three races (NYC ‘15, La Havana ‘15, NYC’ 16). Louis currently lives in Flatiron. He is a member of the New York Private Equity Network Real Estate Group, the Lumen Institute, YPONextGen and the Urban Land Institute.